Every trail is on a easy to read 2 page spread. Perfectly suited for 4-wheeling newcomers and experienced off-road veterans, this wide range of 100 trails in California will satisfy whatever kind of adventure you’re craving. With so many choices, you’ll find a new favorite every day. This book replaces two previous black-and-white books that were written over a decade ago. In that time, some of the trails were closed. We whittled our list of open trails down to the best 100. We think these trails are, collectively, the best batch of California trails ever put together in one place. Whether you are a newcomer to 4-wheeling or an experienced veteran, we guarantee you’ll have fun. 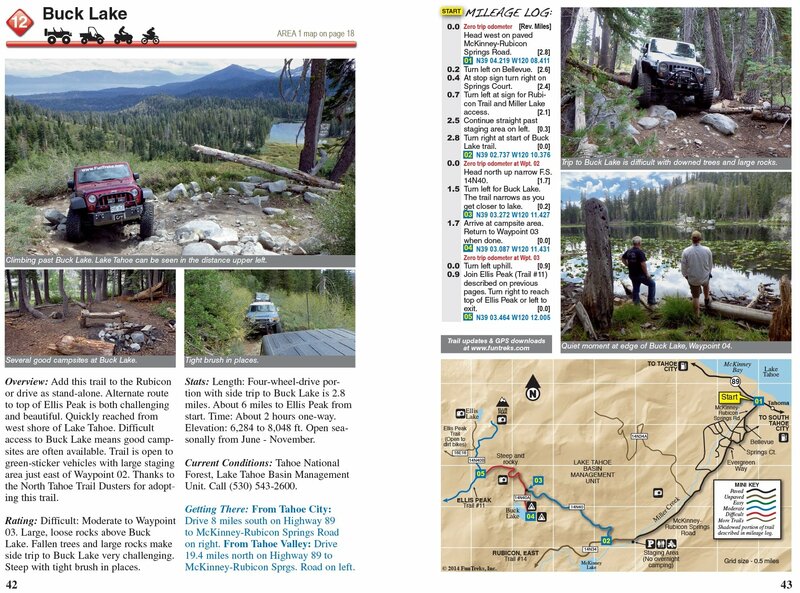 The new format shows every detail about a trail on a handy two-page spread. Easy, moderate and difficult routes are color coded, while vehicle symbols quickly show kinds of vehicles allowed on each trail.This includes unlicensed UTVs, ATVs and dirt bikes. Reverse mileages are now included for all trails, and more historical highlights have been added. A separate mileage log has numbered locations that graphically jump off the page. Our new maps now include detailed relief backgrounds, referencing the numbered locations between the mileage log and map makes it easy to sense your location. In addition, exact GPS coordinates are provided for each numbered location. Excellent book! Exactly what we were looking for. Great book for someone getting into the hobby. Might want to consider a different book if you want an in depth coverage of a specific area of California. Awesome book. Have yet to try it out but the photos, maps, and directions make it all so much easier to figure out. Great product. Doesn’t cover all of the areas I travel in but I guess that is reasonable based on the size of the publication and the price paid for it. Great guide if you are unfamiliar with California trails. I’ve been on a number of the trails and the guide is very accurate. Great guide and I would differently recommend. Well written book. Great pictures and clear route instructions. I recommend buying it to others. Love this book, already did three trails. I like the GPS way points and detailed little pointers with the mile markers. A must if you wheel in the back country. “Guide to California Backroads and 4-Wheel-Drive Trails” was one of the first guides I bought for my backcountry SUV trips. I have found this to be an excellent general guide to popular trails throughout California. Great book….some of these back roads are insane…. Love it! I have four of these books now. Great layout, easy to use and read. Have showed them to several folks in the office and I believe they have ordered copies for themselves. Well written Guide. Excellent to use I would recommend two copies, one for in the vehicle and one for in your library so you can plan ahead. I am also going to purchase the Guide to Arizona Back Roads.